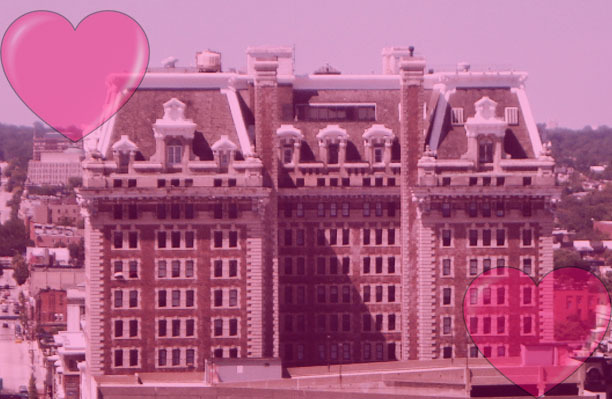 Declare your love to the Baltimore building that has you smitten in a 150 to 450 word letter. Don’t worry if you’re not a writer. Don’t worry that you are truly, madly, deeply in love with a building that other people don’t know exists. We want to hear from you! We will feature a letter in each edition of Keystone, our bi-weekly e-newsletter. All letters will then be archived here on our website. Please include the address of your beloved building and if possible, a digital image. Authors should also include a short, 1-sentence bio. Letters will be reviewed and copyedited by BAF staff. Subscribe to Keystone, the BAF e-newsletter. Howard Peters Rawlings Conservatory- How long have you been standing there, Mr. Conservatory? Designed by George Frederick, you opened your doors on August 26, 1888. We did not meet until long after that when I was 13, in middle school, grade eight. The Patterson Theater- Like many generations before me, the bright red sign with their marquee lights, sticky theater floors and smell of buttery popcorn gives one thoughts of nostalgia and all the "warm and fuzzies." Baltimore Basilica- I am still reminiscing about how detailed and beautiful your architecture was in the summer of 2006. I was much younger then, but I can still remember the way you made me feel when I first walked in with my grandmother that pleasant Sunday. It is now 2017, and my feelings have only grown for you. 1307 Park Avenue Letter #2- I miss you dearly and cannot wait until the day we can see each other again. I am so sad for you, as you wait to get the answers you desire with Zelda’s condition. It pains me to know that you cannot enclose your walls to the whims and sorrows of Francis. Clarence M. Mitchell, Jr. Courthouse and Courthouse East- Oh Baltimore, oh Baltimore, order in the court! If you have ever had the pleasure of working in the legal field, or even served your civic duty as a Baltimore City juror, you have engaged with the Clarence Mitchell, Jr. Courthouse located at 110 N. Calvert Street—the epitome of an architecturally sound historic building. Bromo Seltzer Tower- You are beautiful! You are a melodic combination of brick and style, standing 289 feet high above the ground, a true trend setter of your time. With every glance I take of you, my heart races and my breath stops as I am once again floored by your architectural beauty and your timeless elegance. 924 North Charles Street- Families and their friends, retailers and their shoppers, and restaurateurs and their guests have peered out your windows and witnessed in miniature the transforming of a nation and its people. Zion Lutheran Church- This grand building, once labeled the ‘German Cathedral’ is home to so many treasures. Initially called the ‘Evangelical Lutheran Congregation at Baltimore Town,’ when established in 1755, it has remained a ‘Beacon of Light’ to so many. The Carroll Mansion- The last home of the last surviving signer of the Declaration of Independence, you're often overlooked by locals, historians, and tourists. It's an unfair fate. You were the palatial final home of Maryland's most important Founding Father and you are the most successful example of adaptive reuse in Baltimore City. The Bell Foundry- I first entered your space almost ten years ago, when a friend invited me to a local music show. I was in awe of your innards. I had driven by many times before, but unaware of your contents, I stayed away, even though your outward appearance seemed ever so inviting. The Assembly- I remember the first time I saw you; your our distinctive rugged brick exterior was love at first sight. I couldn’t believe I hadn't stumbled across you before. Phoenix Shot Tower Letter #2- When I first came to Baltimore, I noticed you standing tall and proud and I wondered what you could be. Your warm red bricks cast a welcome over you tall, intimidating appearance. The Walbert- I recently learned that you owe your existence to Emperor Napoleon I of France! For it was his great-nephew Charles Bonaparte—a Baltimore lawyer and Theodore Roosevelt’s attorney general—who was responsible for the original plans to construct you in 1907. Mount Vernon Place United Methodist Church- Churches are the buildings that tend to stand out the most in a city—their features, their stained glass windows, the way they often tower over the buildings that surround them. However, you are something special, Mount Vernon Place United Methodist Church. Fifth Regiment Armory- It was a cold and dreary day in February when I first beheld your regal architecture up close. Your large stone walls were coated in frozen rain, which shimmered in the sparse sunlight. Meadow Mill- I am fortunate to live on a hill overlooking you. I love you most on clear mornings, the sun behind me when I step out and see your cupola bathed in golden light against the lush green of Druid Hill Park. Your presence is magisterial. Mill Centre- I work at the Mill Centre at 3000 Chestnut Avenue in Hampden. When our company came here four years ago it was a bit run down, having been renovated last in 1987. But it appealed to us because it was quirky, misshapen and flawed—yet stoic, imposing and impressive. Phoenix Shot Tower- During the Cuban Missile Crisis you were a designated bomb shelter. A large number of city residents were expect to survive an expected Soviet strike by sheltering within your walls, which are four and a half feet thick at the base. 1307 Park Avenue- I feel a sentimental connection to 1307 Park Avenue, not owing to my own memories, but a connection to F. Scott Fitzgerald's life in Baltimore. The Eisenberg House- My grandfather, Benjamin Eisenberg (1900-1974) was a renaissance man of many talents. In the 1940's Ben and his wife Eunice traveled to Miami Beach in their Lincoln convertible. There he received inspiration for the late Art Deco design of their home at 2105 Erdman Avenue. Homewood House- A few blocks from my house, on a green hill overlooking Charles Street on the campus of the Johns Hopkins University, your red-brick and white-porticoed self fairly sings. You're one of the best-preserved Federal-style houses in the country, a National Historic Landmark, a brilliant jewel in Baltimore's architectural diadem. Patterson Park Pagoda- I remember the first time I saw you. It was a summer day in 2010. I had just come to Baltimore and I was still trying to take it all in, and then, through the trees I saw you. You reminded me more of my time in South Korea than anything I’d seen in the States. The Horse You Came In On Saloon- A lot of important moments in my life happened before or after stopping by to visit you. There are a lot of bars in Fells Point, and considering I don’t really like bars, there are reasons I would insist on The Horse when it was my turn to pick where to go. Peabody Library- Down the grounds at the crossing of Mt. Vernon Place and Charles Street, I find myself entranced by your presence. I ascend your marble steps swept in the autumn morning mist. I enter the library and I am born once again. Baltimore City Jail- I'm not sure if this wonderful building, which has been a setting for many bad things and has now been closed, will be demolished along with the mid-20th century additions. That marvelous pyramid roof and the stone building must be kept, if only to remind us of its sordid story. Eutaw Place Temple- Your big dome is always the first thing I catch a glimpse of as I make my way along Eutaw Place from State Center. The texture created by the clay tiles, the slight flare at the eave, and the rich patina of the surrounding metal intrigued me. I've driven by you for years not knowing your history. A synagogue for sure, but was that still your purpose? Hendlers Creamery- Every time I pass you by (which is every day on the way to work), I can’t help but sigh as I think about a delicious mint chip filled-waffle cone, and imagine you all decked out and celebrating Baltimore’s role in the grand history of American ice cream. The B&O Railroad Icosikaidigon- Yes, most people know you simply as "The Roundhouse," but I know you better than that. You aren't round, you are an icosikaidigon, or twenty two sided polygon. Maple Hill- Unremarkable rowhouses now line the rolling hills where the conifers of your grand estate stood. The weeping willow, that persistent antebellum symbol, is long gone too, and your winding carriage path is now a straight road lined with too many cars. I should admit (embarrassed as I am to tell you) that I live in one of these unremarkable rowhouses. Hampden Presbyterian Church- I didn’t notice you at first. I don’t think most people did, which is strange because you are the most striking building on the block. The Furness House- The first time I saw you, I was driving down South Street. I felt that I had known you forever. You were in my dreams for ages. The Belvedere- I wish I could have seen you in your prime. Vestiges of your splendor remain—gilded ballrooms, grand chandeliers, lavish boiserie—that fill my mind with romantic images of your romantic past. The Mechanic Theatre- By the time we first met, your doors had been shut. Lights long switched off. And yet there we were. Unaware of each other. The Mayfair- I am a photographer who has studied and researched most of the theaters in Baltimore, but the one I love the most is the Mayfair. It was the building that made me want to become a theater historian and study the fine buildings in Baltimore. The Telephone Building at 320 St. Paul Street- I always thought I grew up in the wrong decade. Noir movies, forties fashions and Art Deco architecture are among my long time favorites. That’s no doubt why, on a recent gray Sunday morning, the Telephone Building at 320 St. Paul Street caught my eye. 39 West Lexington Street- I’ve always loved architecture in general and I don’t remember exactly when I fell in love with 39 West Lex, probably because it feels like I always have been. The Carriage House- I realize that you are gone, but I just wanted you to know that you were appreciated while you were here. Even with your collapsing roof and the plywood in your doors and windows, you were admired, even loved. The McKim Free School- One winter, many years ago, I used to serve coffee and muffins to homeless people over on East Baltimore Street. They congregated around a building that I fell in love with. It was the McKim Free School, in the historic Jonestown neighborhood.